Have you ever gotten a message/note/email that made you feel all kinds of honored? I did a few weeks ago. It was from Jerry Paul. He was the president of my college (Great Lakes Christian College) for the first few years I attended. His message? He’d written a book because he was inspired by my writing and publishing life. Well, that was exciting for me to hear. Then, he offered me a copy of the book as a “thank you”. I didn’t feel like I’d done so much, but I’ll always take a free book, especially when I know that it’s going to be a good one. 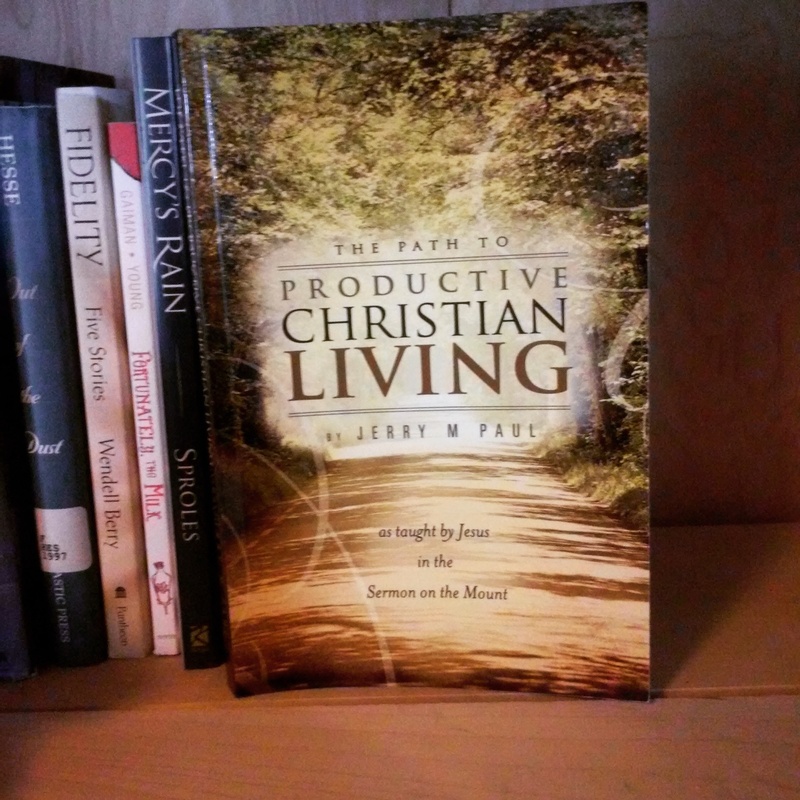 Last week, I read Jerry’s book The Path to Productive Christian Living and was not disappointed. He’s a good writer and I could hear his booming voice as I read. He wrote about The Sermon on the Mount and I believe this would be a good book to be read in a small group/Sunday school class/Bible study as a companion to the Scripture. It was a good book for me to read around Easter, reminding me of the ways Christ calls us to live as His followers. I was encouraged and challenged and caused to ponder. Jerry wrote in a way that didn’t make me feel twisted around and confused (like some theology books have a way of doing). His writing was accessible, which I truly appreciated. Another reason I gained so much from this book is because I know Jerry M. Paul has lived a life on this journey to follow Christ. He’s a humble man who is full of grace (I received that grace and a bunch of mercy after I dinged the bumper of his pristine car while in college). He is wise and encouraging. He truly loves Jesus and the Word of God. In his book, he offers the gift of his life experience. I’m glad to know Jerry M. Paul. I’ve always looked up to him. And I’m happy to have read his books, his offering of encouragement to readers. What’s a book that has encouraged you or made a difference in your life? It’s wonderful that someone you admire and look up to has seen how the Lord is using you and your gifts to further His kingdom! The book that has most encouraged and inspired me in my life over the past several years is “Just Think” by Nancy Nordenson. I was so challenged by her words that I e-mailed her and we’ve become “cyber-friends”. I was blessed to meet her at Calvin’s Festival of Faith and Writing. I continue to reference her book and I’m looking forward to her newest, “Finding Livelihood”, due to be released this spring. That’s one beautiful thing about the internet: the ability to be connected to other writers! I’m glad you were able to meet her! And, if you’re planning on going to FFW again next April, I’d love to hang out! You bet! I haven’t missed one in 10 years — a great place for book junkies and writers to come together.